Cranfords are delighted to present apartment 115 in the highly sought after Rosaire Court Complex to the local market. This immaculately presented freehold apartment is exclusively available to anyone over fifty five years of age and is conveniently situated close to the local amenities and boasts an on site restaurant, cafe and hairdressers. This purpose built second floor apartment is light and spacious throughout and is presented in true move in condition and has been recently redecorated and re-carpeted by the current owners. 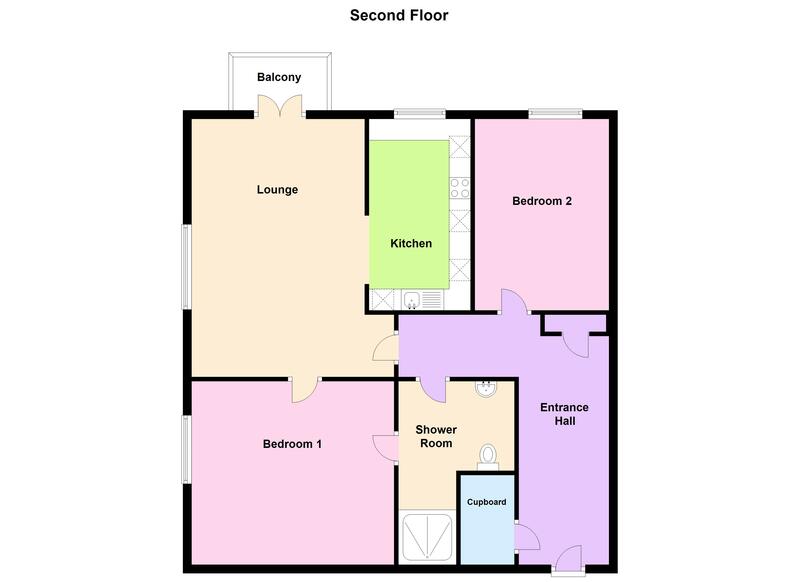 The accommodation comprises an entrance hall with two useful storage cupboards, a modern shower room/wet room, a generous sized lounge with double doors leading to a private balcony, a modern and well equipped kitchen and two good sized bedrooms, bedroom 1 boasting fitted wardrobes. The property also benefits from the use of a communal garden and there is an allocated parking space as well as visitor parking. Overall this superb property would make an ideal downsize for those looking for the reassurance of 24 hour warden emergency cover whilst retaining their own independence and early viewing is highly recommended. Call Cranfords on 243878 to book your viewing today! 12'10'' x 6'7" x' 4'10". 10'8'' x 6'. Appliances include Hotpoint oven & grill, Hotpoint dishwasher, Hotpoint 4 ring hob, Hotpoint washer/dryer, Hotpoint fridge/freezer and Hotpoint extractor hood. 14'5" x 10'9". Fitted Wardrobes. Mains electricity and water and mains drainage. Electric underfloor heating. £234 per month (building insurance, communal upkeep and water). Floor coverings, curtains/blinds, appliances as listed and light fittings.